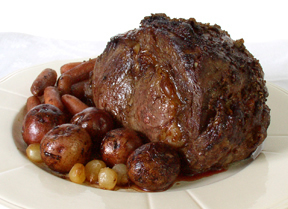 Herbed Beef Roast makes an elegant meal for special occasions. 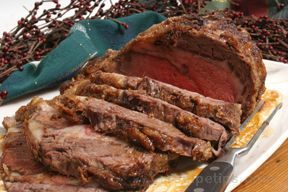 Be sure to allow a 10-minute standing time before carving so the meat temperature will rise and the meat will carve more easily. 1. Preheat oven to 350° F. Place meat on rack in shallow roasting pan. Mix Italian seasoning, seasoned salt and pepper. Press evenly into surface of meat. 2. 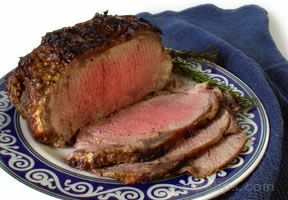 Roast, uncovered, until internal temperature reaches 135° F for medium-rare (1 3/4 to 2 1/4 hours) or 150° F for medium (2 1/4 to 2 3/4 hours). Add water to baking pan after 1 hour of bake time to use for drippings. 4. For the Gravy, mix Gravy Mix and flour in medium saucepan. Gradually add water and beef drippings, stirring with wire whisk until smooth. Bring to boil on medium heat, stirring occasionally. Reduce heat to low; simmer 5 minutes.